Announcement: As of April 1, blue bags cannot be placed in recycling dumpsters on campus. They are considered a contaminant. Please empty recyclables out of blue bags into the recycling dumpster and place the empty blue bag into the landfill dumpster. To meet its goal of climate neutrality, the University of Richmond is committed to reducing waste through the Rethink Waste campaign. Minimizing campus waste reduces emissions beyond the campus, and because these efforts are often highly visible, they are a large contributor to environmental awareness throughout campus. One of the first steps towards this goal is the University's commitment to acheiving a 75% waste diversion rate by 2025. This means that we will reuse, reduce, recycle, and compost so that 75% of our waste does not go to a landfill. Recycling has been in place at the University since 1991, beginning as a coordinated effort between the University’s environmental services department and interested students. Today, the University has two dedicated recycling technicians working in facilities, and an extensive recycling program for a variety of materials. In 2015, the University recycled 363 tons, composted 21 tons, and landfilled 1519 tons of material. An additional 15 tons were reused or resold through our furniture reuse, Office Supply Exchange, and Big Yard Sale programs. We recycle 91% of construction waste on campus and staff in Heilman Dining Center manage an innovative pre-consumer food waste composting program that sends more than 40,000 pounds of food waste a year to responsible reuse. University of Richmond uses mixed or single-stream recycling on campus. All recyclable materials can go in any blue recycling bin. Recycling is an important piece of the University's sustainability efforts, but remember that reducing and reusing is even more important. The University uses blue recycling bins and black, grey, or tan trash bins. Please read the labels and signs on bins to ensure that your trash and recycling end up in the correct bin. Take a quiz to test your recycling knowledge on our Be a Green Spider page. When purchasing products and services, University offices are encouraged to consider third-party sustainability certifications—such as Green Seal, GreenGuard, Energy Star, and the Forest Stewardship Council—whenever possible. Contracts also have specifications for recycled content for custodial, office, and food service paper products; 80% of these products must contain 30% recycled content. The Office for Sustainability staff and interns are available to provide Rethink Waste trainings for residence halls, offices, classes, and departments. These trainings cover what can be recycled on campus, how to properly recycle items, and information about sustainability at University of Richmond. Please contact sustainability@richmond.edu to set up a training. Why do we use blue bags and why can't I recycle them? We line recycling bins on campus with blue plastic bags. This ensures that bins stay clean and that custodial staff can easily transport recyclables outside to dumpsters. Unfortunately, blue bags are now considered a contaminant and cannot be placed in recycling dumpsters. At the materials recovery facility where our recyclables are sorted, these bags can get tangled up in machinery and cause damage. If you are taking recyclables to a dumpster, please empty recyclables out of blue bags into the recycling dumpster and place the empty blue bag into the landfill dumpster. -Plastics 1-7, including disposable cups, shampoo bottles, water bottles, takeout containers, peanutbutter jars, and yogurt containers, among many other items. Items should be emptied of food or liquid before being recycled. Please pour excess liquids into a compost or landfill bin before placing items into a recycling receptacle. Soft plastic (like plastic wrap), straws, plastic utensils, and plastic-lined paper cups (ex: a paper cup from Starbucks) cannot be recycled. 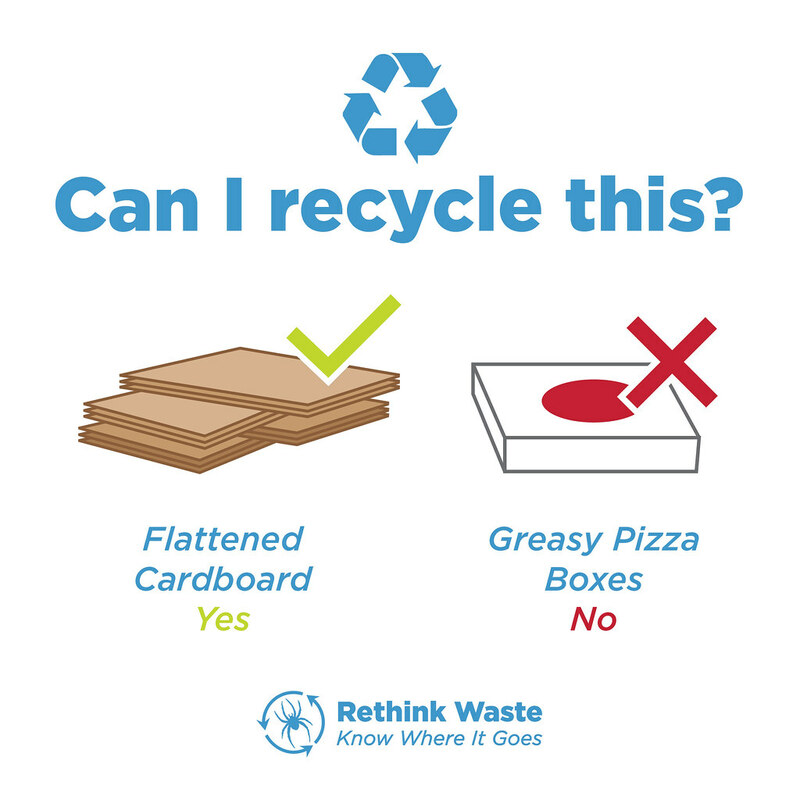 What cannot be recycled on campus? 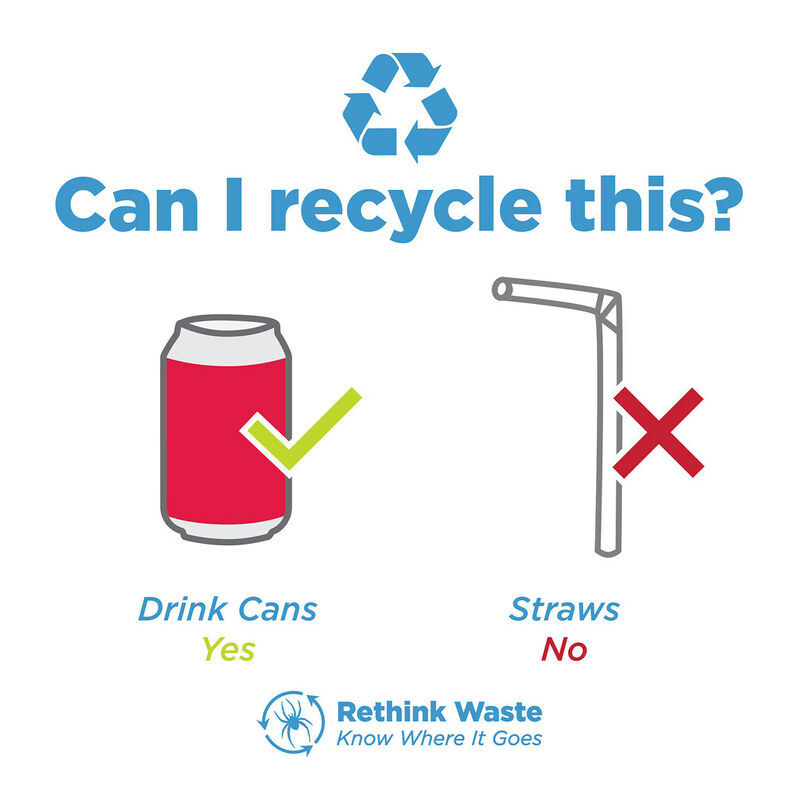 When any of the above items are put in a recycling bin, they contaminate that batch of recycling. After a certain amount of contamination, that whole bin's worth of material must be sent to the landfill. 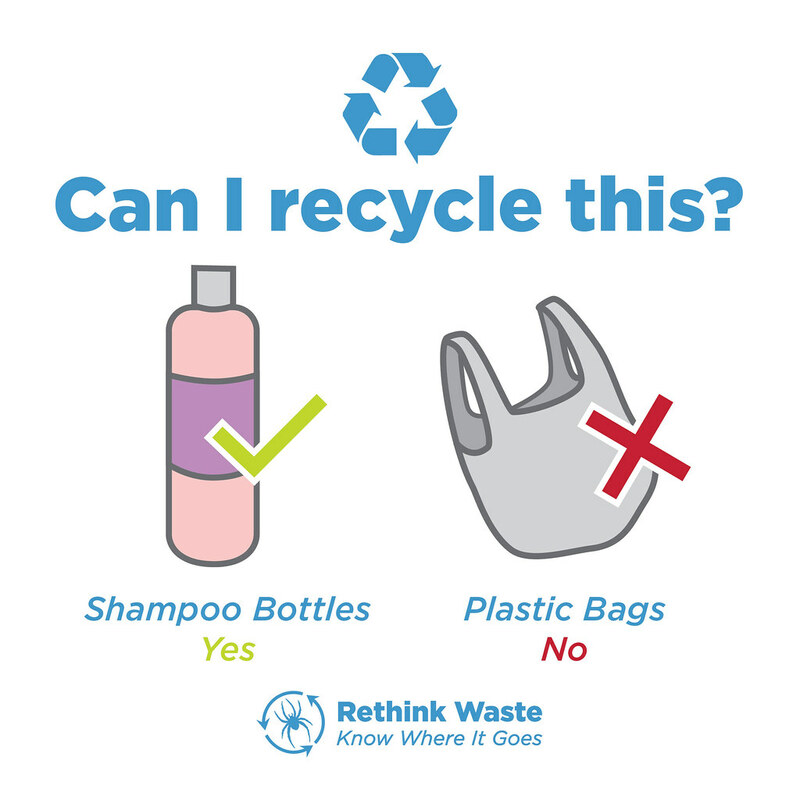 Reduce contamination by rinsing and emptying all plastic or glass bottles, jars, and containers before recycling them. Where does UR's waste go? - Municipal solid waste is transported to Old Dominion Landfill located to the east of the city of Richmond in Henrico, 14 miles away. - Single stream recycling is transported to the County Waste Material Recycling Facility in Chester, 18 miles from campus. - Cardboard is taken to Weyerhaeuser in Richmond, 10 miles away. - Metal goes to Sims Metal Management 11 miles away in Richmond. - Yard Waste is taken to Gillies Creek Recycling in Richmond, 14 miles away. - Wood waste goes to SB Cox 10 miles away in Richmond. What if I want to recycle plastic bags? Plastic shopping bags, sandwich bags, and soft plastic packaging cannot be recycled in bins on campus. However, many grocery stores offer plastic bag recycling programs. If you would like to collect and recycle your plastic bags, use A Bag's Life to find a recycling location near you. How can I recycle Styrofoam? Styrofoam cannot be recycled in bins on campus. Many Publix stores, however, have bins for Styrofoam recycling. If you are a Publix customer, you can call a store near you and see if a Styrofoam recycling bin is available at a particular location. Can I recycle Keurig pods? The foil on top of Keurig pods is recyclable, but the pods themselves are not. There is a program for recycling them that involves ordering a collection bin. This is a good option for offices. Heilman Dining Center currently composts over 40,000 pounds of pre-consumer food waste each year. What can I do with e-waste, like computers and batteries? Batteries and electronics often contain chemicals that are harmful to the environment, so it's not a good idea to put these in a landfill bin. The University hosts an annual e-waste disposal event where you can bring batteries, electronics, hard drives, and more. Batteries can be recycled in the bin at Boatwright Library outside 815. Electronics, like laptops, purcahsed by the University should be returned to Information Services. -Donate office supplies through the UROSE Office Supply Exchange in Puryear 101A. -Donate clothing, school supplies, small electronics, and more through Donation Stations in every residence hall's lounge or laundry room. -Drop off items at Goodwill bins at Marsh Hall, North Court, or Lora Robins. -Contact Facilities to donate office furniture. -Donate items from your residence hall or apartment to the Big Yard Sale each May. How can I reduce waste every day? How can students get more involved? How can faculty get more involved? How can staff get more involved? Please direct your questions and comments to sustainability@richmond.edu.